Summary Report of Proceedings of the Legislative Assembly Meetings held in 23rd November 19th December 2017 & January 12th 2018. S R & O No. 64 of 2017 Legislator’s Conditions of Service (Repeal) Regulations Order 2017. S R & O No. 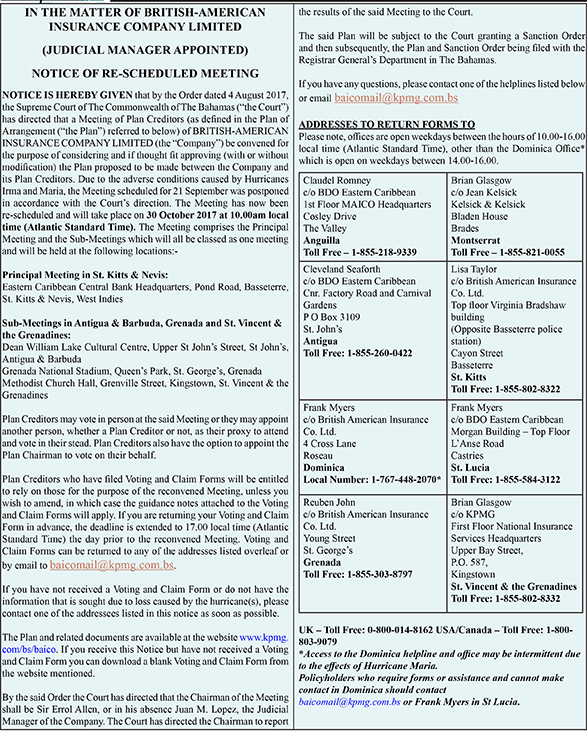 67 of 2017 Race and Speed Trial (Designation of Place) Order 2017. Montserrat Financial Services Commission Audited Financial Statement for year ended 31st December, 2017. This Bill sought to sanction certain payments from the Consolidated Fund and Development Fund in excess of the sums provided by law for the services of the Government of Montserrat. The Bill was passed with minor adjustments. The Bill seeks to provide greater protection for victims of domestic violence and to make provision for the granting of protection orders and for connected matters. Part I deals with the short title and interpretation, part 2 deals with protection orders, part 3 deals with police powers of entry and arrest and part 4 deals with miscellaneous matters. The Bill was referred to a select committee which would report back to the Legislative Assembly within six months. This Bill sought to sanction certain payments from the Consolidated Fund and Development Fund in excess of the sums provided by law for the services of the Government of Montserrat. It was passed with minor amendments to the short title and commencement as follows: Supplementary Appropriation (No. 2) Act, 2017 changed to Supplementary Appropriation (No. 2 of 2017) Act 2018, the name of the Bill was changed from Supplementary Appropriation (No. 2) Bill 2017 to Supplementary Appropriation (No.2 of 2017) Bill 2018. The Bill seeks to replace existing company statutes with a new up to date, Companies Act. Part I deals with the short title and interpretation, part 2—formation of companies, capacity and powers, part 3—shares, distributions and share redemptions, part 4—members, part 5—company administration, part 6 directors and secretary, part 7—registration of charges, part 8—receivers and receiver-managers, part 9—merger, consolidation, sale of assets, forced redemptions and arrangements, part 10—continuation, part 11—members’ remedies, part 12—foreign companies, part 13—strike-off and dissolution, part 14—liquidation, part 15—investigation of companies, part 16—administration and general, part 17-miscellaneous and transitional. 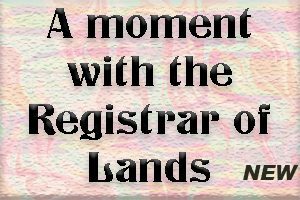 TAKE FURTHER NOTICE that any person who objects to the issuance of new Land Certificates or who has knowledge of the lost Land Certificates must within the period of fourteen (14) days from the date of publication of this notice in the newspaper inform the Registrar of Lands in writing. TAKE FURTHER NOTICE that in the absence of an objection or information as to the existence of the lost Land Certificates within the time specified, the Registrar of Lands may proceed to cancel the original Land Certificates and issue new Land Certificates without further notice. Dated this 7th day of December 2017. Summary Report of Proceedings of the Legislative Assembly Meetings held in June 2017.